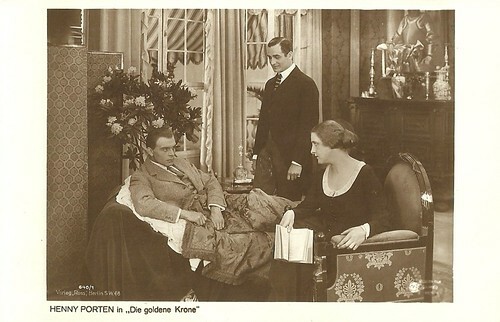 Henny Porten, Hermann Thimig and Paul Hartmann star in the German silent film Die goldene Krone/The Golden Crown (Alfred Halm, 1920), produced by Messter-Film GmbH. Ross Verlag presented this series of seven sepia postcards with scenes from the film. None of our usual sources offered a plot of the film, but in Die Freie Deutsche Bühne of 22 August 1920, we discovered a review by acclaimed author Joseph Roth. German postcard by Ross Verlag, no. 640/1. Photo: Messter. 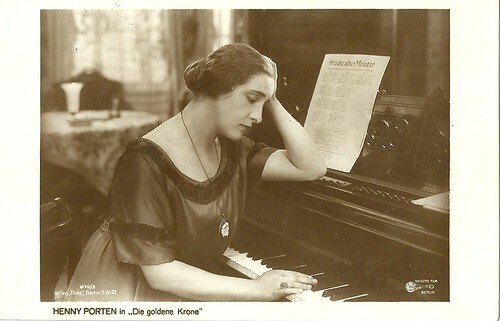 Publicity still of Henny Porten in Die goldene Krone (Alfred Halm, 1920). German postcard by Ross Verlag, no. 640/2. Photo: Messter. Publicity still of Henny Porten in Die goldene Krone (Alfred Halm, 1920). German postcard by Ross Verlag, no. 640/3. Photo: Messter. 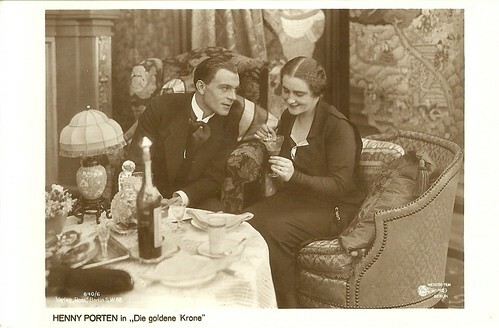 Publicity still of Henny Porten and Paul Hartmann in Die goldene Krone (Alfred Halm, 1920). 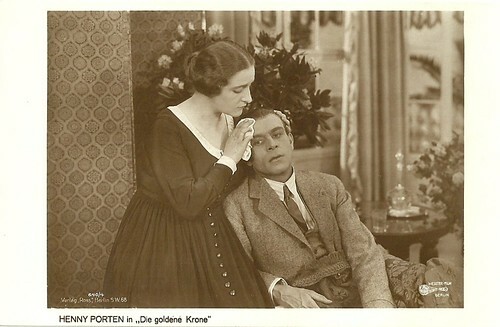 In Die goldene Krone/The Golden Crown (1920), Henny Porten plays Marianne, daughter of the owner of the hotel Zur goldene Krone (At the Golden Crown). She loves a duke, Franz Günther (Paul Hartmann), who has tuberculosis and is mortally ill. To prevent the bankruptcy of his hotel, Marianne's father wants her to wed Klaus (Hermann Thimig), son of rich fish trader Stöven. Klaus, who is a good sport, is prepared to compromise and accepts her affair. But as Joseph Roth writes in Die Freie Deutsche Bühne, Marianne breaks up 'betrothal, best wishes, wedding nights' and flees Klaus to take care of the dying duke, with all her efforts. However, the duke's family arrives and Marianne has to step back, right in the night when he dies. On his deathbed the duke commissions his aide-de-camp to marry Marianne, but the latter shoots himself because of the family. Marianne returns to her father's hotel to help it rise again. There Klaus returns to her and they marry at last. Of course there is no proof about the reliability of Roth's plot description, and his negative final judgment might have influenced the rest of the text. In his introduction Roth stressed that Olga Wohlbrück, on whose story, published in Die Berliner Woche, the film was based, was a 'Courts-Mahler mit Niveau, und grammatikalischem Deutsch'. Wohlbrück's stories were popular among middle class women, as they always treated young women as protagonists who because of class difference could not marry their beloved aristocrats. Nobody is guilty, it is just fate. It is presented with credibility and cool detachement. Meanwhile the stories give insight in life in the higher classes. 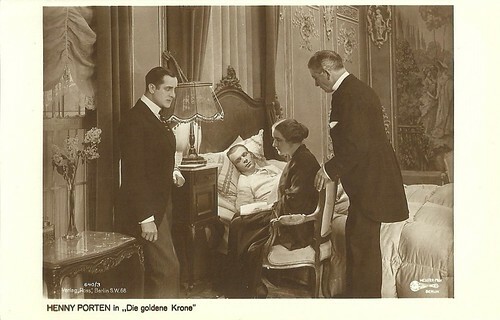 Die goldene Krone had its first night in Berlin on 6 August 1920. The film was scripted by director Alfred Halm and Hans Bennert. Sets were by Ludwig Kainer and cinematography was by Willy Gaebel. At the end of his critique, Joseph Roth, seriously condemned the film from his left-wing perspective: "Yet, I protest that today, on 7 August 1920, less than 2 years after the revolution, the world view of Die Woche is spread from cosy family circles to the masses by means of cinema. That 'fatzery' tragically works, because Olga Wohlbrück needs to live. I protest." Roth may have been overcharging it a bit, but it is indeed ambiguous that while the Weimar Republic in 1919 stripped the German nobility of all legal privileges and immunities, the aristocracy remained such a focus within the mainstream German cinema. German postcard by Ross Verlag, no. 640/4. Photo: Messter. Publicity still of Henny Porten and Paul Hartmann in Die goldene Krone (Alfred Halm, 1920). German postcard by Ross Verlag, no. 640/5. Photo: Messter. Publicity still of Henny Porten in Die goldene Krone (Alfred Halm, 1920). German postcard by Ross Verlag, no. 640/6. Photo: Messter. Publicity still of Henny Porten and Paul Hartmann in Die goldene Krone (Alfred Halm, 1920). German postcard by Ross Verlag, no. 640/7. Photo: Messter. Publicity still of Henny Porten and Hermann Thimig in Die goldene Krone (Alfred Halm, 1920). Sources: Joseph Roth (Die Freie Deutsche Bühne - German), Filmportal.de, Wikipedia, and IMDb.